There is an epidemic of unhappiness in the American workplace. A full 70 percent of workers in the United States report that they are disengaged from their jobs. When asked, “Do you have the opportunity to do what you do best every day?” only 20 percent of nearly 2 million employees said yes. It is no wonder that 56 percent of all Americans dream of starting their own business. So why don’t they do so? Because starting one’s own business is seen as difficult, expensive, and risky. 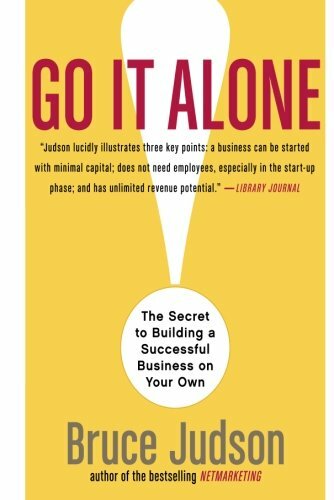 In this extraordinary book, successful Go It Alone! entrepreneur Bruce Judson explains that the conventional wisdom about starting your own business is stunningly wrong. Using the leverage of technology — e-mail, the World Wide Web, and the remarkable array of off-the-shelf business services now available — it is dramatically easier to start your own business. Magnified by these new services, it is also possible to create, for the first time, a highly focused business.